In celebration of My Little Pony: The Movie, in theaters October 6, Musselman’s is giving away a Carnival Cruise and other My Little Pony prizes. 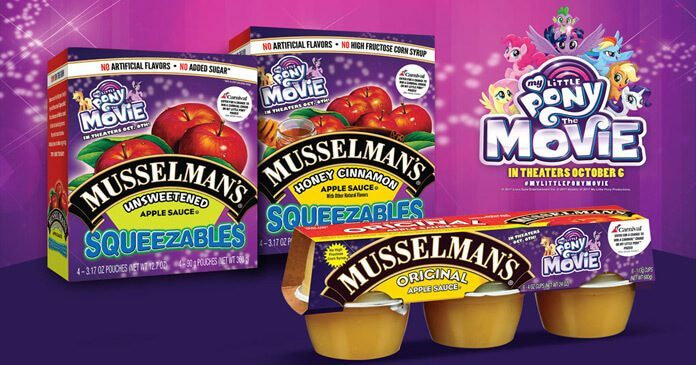 Enter the Musselman’s My Little Pony Sweepstakes by January 31, 2018 for your chance to win. The Musselman’s My Little Pony Sweepstakes is open to all residents of the United States (excluding California) who are 18 years of age or older as of date of entry. The Sweepstakes starts on August 1, 2017 at 12:00:01 AM ET and ends January 31, 2018 at 11:59:59 PM ET. duration of the Promotion Period, regardless of the method of submission. Potential winners will be selected in a random drawing on or about February 23, 2018 from among all eligible entries received by Sponsor, whose decisions as to the selection of winners will be final and binding in all matters relating to this Sweepstakes. One (1) Grand Prize: A Carnival Cruise Line gift card for $2,500. Five hundred (500) Second Prizes: A Musselman’s Coupon Sheet (total of $10.00 in coupons which can be used toward the purchase of various Musselman’s Apple Sauce products). For a list of winners (available no later than 4/15/18), visit www.musselmans.com/offers-promos. Sponsored by Knouse Foods, Inc. and Knouse Foods Cooperative, Inc. 800 Peach Glen-Idaville Road, Peach Glen, PA 17375.